– New 2.0-litre turbocharged four-cylinder added as base model (240 hp). – New 3.0-litre supercharged V6 added (340 hp) in conjunction with new all-wheel drive system. – V6 and V8 models receive auto stop/start system for improved fuel economy. – All models receive new ZF-supplied eight-speed automatic transmission. – Optional Speed Pack for XFR includes suspension and aerodynamic changes, increases top speed from 250 km/h to 280 km/h. – New Meridian premium audio systems, along with new navigation and infotainment systems. Jaguar has rolled out some significant changes across their range of cars for 2013 and their XF model is certainly no exception. The midsize Jaguar receives two new engines – 2.0-litre turbocharged four-cylinder and 3.0-litre supercharged V6 – along with new driveline mechanicals, including all-wheel drive for V6 models and a new XF-sourced eight-speed automatic transmission for all engine options as standard. Inside the XF, new audio, navigation, and infotainment systems adorn the dash. Those interested in all out speed can go for the XFR, now available with an optional Speed Pack including suspension and aero changes that increase the model’s top speed by some 30 km/h. Along with all these changes is a very important deletion: the non-R 5.0-litre V8 engine. It’s effectively been replaced by the supercharged V6. Those looking for V8 power will now have to opt for the XFR. 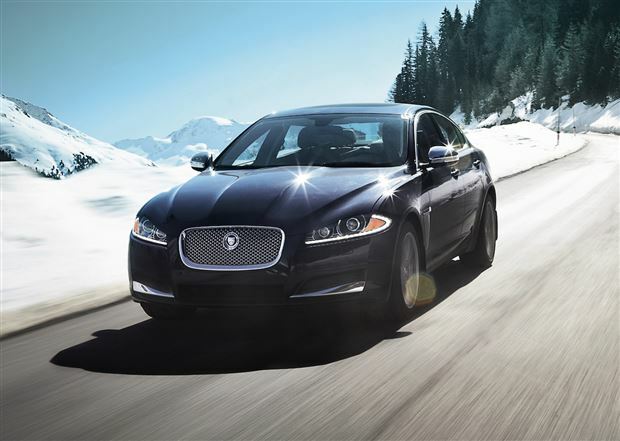 The XF is Jaguar’s entry-level model and includes the XF, XF Portfolio and XFR. The XF and XF Portfolio use a 5.0-litre V8 engine, while the XFR uses a supercharged 5.0-litre V8. All use a six-speed automatic transmission with a rotary gear selector, and steering wheel-mounted paddles for the manual shift mode. Features on the XF Luxury include 18-inch alloy wheels, automatic climate control, cruise control with automatic speed limiter, electronic parking brake, bi-xenon headlamps, heated auto-dimming mirrors with integrated turn signals and puddle lamps, rain-sensing wipers, LED taillights, power sunroof, rear parking assist, acoustic laminated windshield, tire pressure monitoring system, alarm system, power tilt and telescopic leather-wrapped steering wheel, auto up/down windows, auto-dimming rearview mirror, garage door opener, driver information centre, keyless ignition, ten-way power heated Bond Grain leather seats with two-position driver memory, 60/40 split-folding rear seat, Bluetooth connectivity, navigation system, six-CD/MP3 stereo with auxiliary input and Sirius satellite radio, full-colour touch-screen display, automatic headlamps with manual levelling, and front and rear carpet floor mats. The XF Portfolio adds 19-inch alloy wheels, blind spot monitor, washers and automatic levelling, front parking assist with rearview camera, electric rear sunshade, Smart Key system, heated and cooled soft-grain leather seats, soft-grain leather door panels, “suede cloth” headliner, ebony trim and premium carpet mats. The XFR adds 20-inch alloy wheels, Adaptive Dynamics, active differential control, rear spoiler, hood louvers, 18-way driver and 14-way passenger power heated and cooled R soft-grain leather seats, premium carpet mats, “suede cloth” headliner, and Bowers & Wilkins 440-watt surround sound system.